Each build of LodeStar includes a new feature that deepens the online instructor’s tool chest. Three new important features accompanied the recent updates to both the LodeStar authoring tool and its most useful template, ActivityMaker. I’ll discuss the three most recent additions with the help of a Literature challenge that was mashed up for demonstration purposes only. When I say ‘mashed up’, in this case, I mean that three strategies have been thrown together that don’t necessarily complement one another well. Two of the strategies, the repeating question and the crossword, are more suited to supporting the acquisition of declarative or verbal knowledge. The Long Answer example supports higher order thinking in the form of analysis. So, these three strategies make strange bedfellows. Nevertheless, the example demonstrates their use. The first strategy is the repeating question. I must admit that I’m not a fan of the question type that resets itself when answered incorrectly. In my observations, responsible students use them to their advantage and the students who need the help the most, misuse them. In the Literature Challenge example, the student is asked to identify a piece of writing. The student is presented with five choices or distractors, which display in random order. If the student answers incorrectly, feedback is shown. After the student clicks the next button, the question is reset and presented again to the student with the re-shuffled distractors. For some students, this will work great. If they answer incorrectly, a form of cognitive dissonance sets in. They realize that, perhaps, they don’t know everything. Consequently, they may pay extra attention to the feedback and then apply their new knowledge. I recently benefited from this strategy in a Quality Matters lesson. I read a paragraph and then did a quick self-check. If I got the answer right, then I received a little confirmation and a little more confidence. If I answered incorrectly, I paid more attention. But, frankly, I am a motivated student. A less motivated student would mindlessly click until being able to move on. So much of computer-based training in the past was designed that way and I spent a lot of time observing students move through it. As I’ve echoed Dee Fink* repeatedly in the past, situational factors (e.g. who are the students) matters a lot when selecting the appropriate strategy. * Fink, L. D. (2003). Creating significant learning experiences: an integrated approach to designing college courses. San Francisco, Calif.: Jossey-Bass. Instructors choose ‘Reset Page’ to repeat a question (i.e. redisplay the page) when a particular answer is chosen or, if a page level branching option is used, when the answer or any combination of answers is incorrect. The second strategy is the long answer question type, supported by an optional journal page that compiles all of the student open responses. In the example, the learning activity asks students to identify how the language differs from passage to passage. This is an open question. Students can type in a short essay. The caveat is that learning management systems handle this question type differently. D2L or BrightSpace, for example, places the student’s answer in the SCORM Report. This may be a little difficult to find. 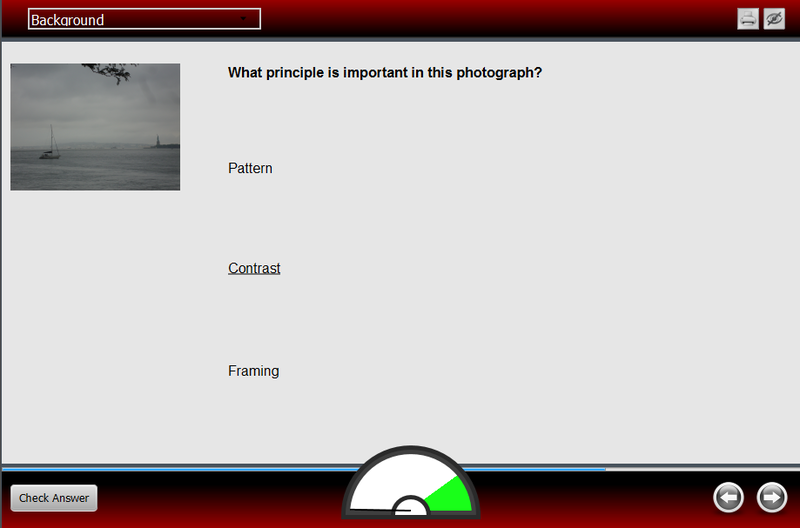 For learning management systems that can’t handle this question type at all, instructors are encouraged to add a journal page. With the latest operating systems, students can ‘print’ the journal page right into a PDF or cut and paste into a Word document and submit the finished piece to a drop box. The advantage to the student is that the learning activity can chunk out the parts and have students concentrate on only one part at a time. For example in a grant writing course that I’ve recently seen designed, students could work on the ‘Objectives’ section after learning about writing objectives. The activity could then lead them into how to write a proposal abstract and then have them write an abstract. In the end, the journal page puts it all together for the student. The third new strategy is the crossword. In our example, students were ‘warmed’ up by identifying authors in ‘repeating’ questions. The main activity was the long answer analysis. The ‘cool down’ activity is a crossword that challenges the student to identify authors that match the literary titles provided as crossword hints. Instructors who wish to compile crosswords for their students can simply choose the Crossword page layout in the ActivityMaker template. Instructors type in a word, hit return, and then type in a short hint. The compiler can easily handle ten or a dozen words. The three strategies outlined in this article contribute to the rich set of options that are available to instructors in the latest release of LodeStar and its main template, ActivityMaker. We know from feedback and experience that students love engaging activities and benefit from them. 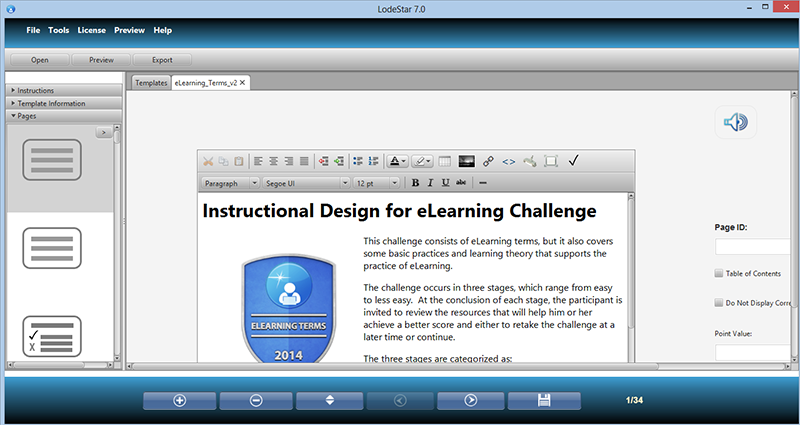 The Instructional Design for eLearning Challenge highlights several features of the latest LodeStar 7.0 build. This article explores those features and exposes some of the design decisions made in constructing the challenge. First, the topic of instructional design for eLearning is immensely broad. Complicating the field is the designer’s own philosophy of the nature and scope of knowledge. Nevertheless, we can assume an instructional designer’s vocabulary includes Benjamin Bloom’s taxonomy, Robert Gagne’s Events of Instruction, an understanding of key terms and practices in eLearning design, and an acquaintance with some of the theories that inform design. This challenge was organized after an attempt to survey the discourse between designers and capture some of the key terms, practices and even theories that are communicated in that discourse. In designing the challenge, I decided to award a digital badge to recognize a participant’s accomplishment in achieving 85% mastery of the content. 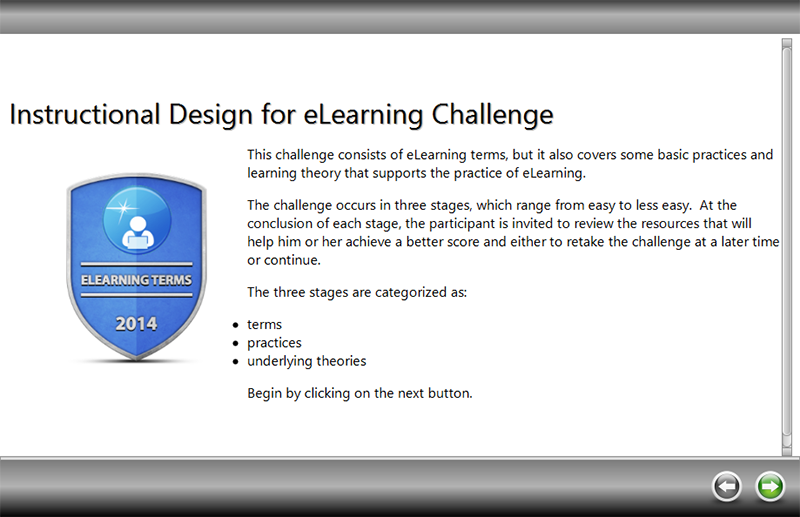 I named this badge ‘eLearning Terms’ because all of the questions in the challenge can be categorized as declarative knowledge. Even the identification of a theory is no more than declarative knowledge. 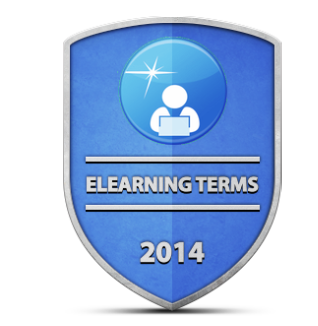 Therefore, the digital badge is named ‘eLearning Terms’ because it is nothing more than a test of one’s knowledge of terms that are used in the field of eLearning design. For designing and hosting a badge, I had several options. One was to stage the badge issuing process following the Mozilla Open Badge Infrastructure. The second was to use a known badge issuer like Basno. Basno.com, for example, is the badge issuer for the completion of the Boston Marathon. The Mozilla Open Badge Infrastructure requires LodeStar Learning to host the badge issuing process on its own servers, which we may very well do in the future. The Basno process was much easier to get up and running quickly. One creates a badge and enables participants to apply for the badge. In addition, I can embed Web 2.0 content on any text page. The next decision was whether or not to create levels for the challenge with performance gates. LodeStar enables authors to create performance gates based on absolute points or percentages. Users who meet or exceed the performance score threshold, branch in one direction; users who fail to meet the threshold branch in a different direction. For this challenge, I decided to create levels, but not gates. At the conclusion of each level, the participant sees his or her score and receives a list of resources that match missed items. At that point, the participant can stop the challenge and review the resources or continue on. At the conclusion of the challenge, the participant is branched to the success page, which provides badge information, or to the failure page. 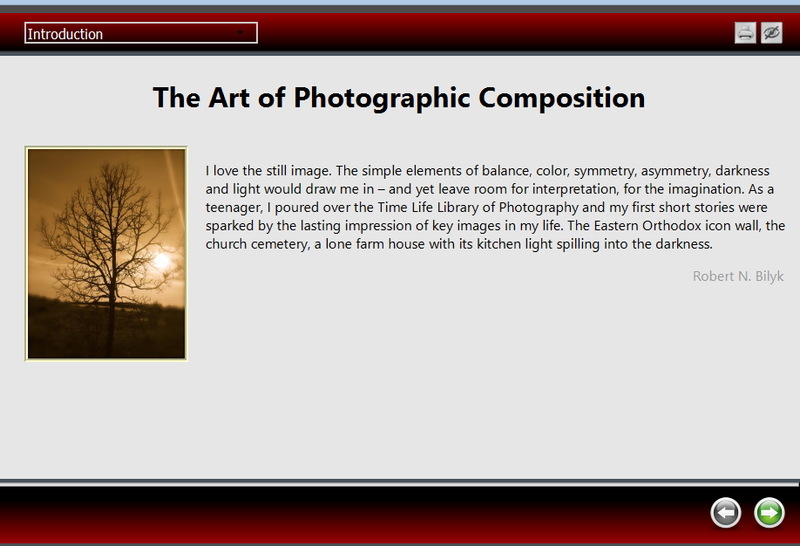 Before I got started inputting the questions, I decided on a theme. 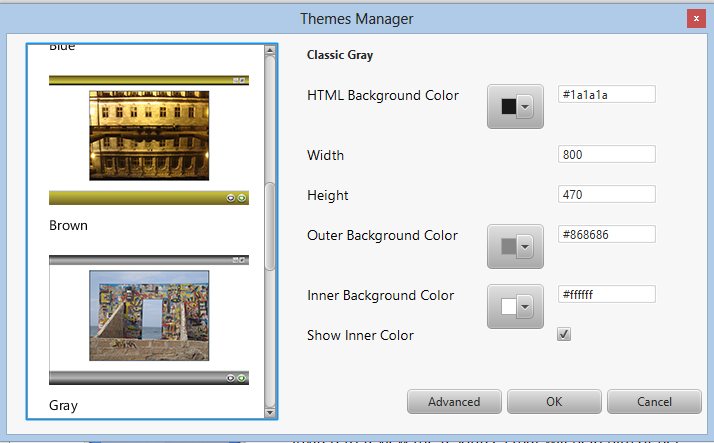 Starting with Build 22, LodeStar introduces new themes that can be totally configurable. If you are working on an older project, please apply a theme to the project. This will lead to faster downloads and an improved experience. I also applied a transition effect to the project. 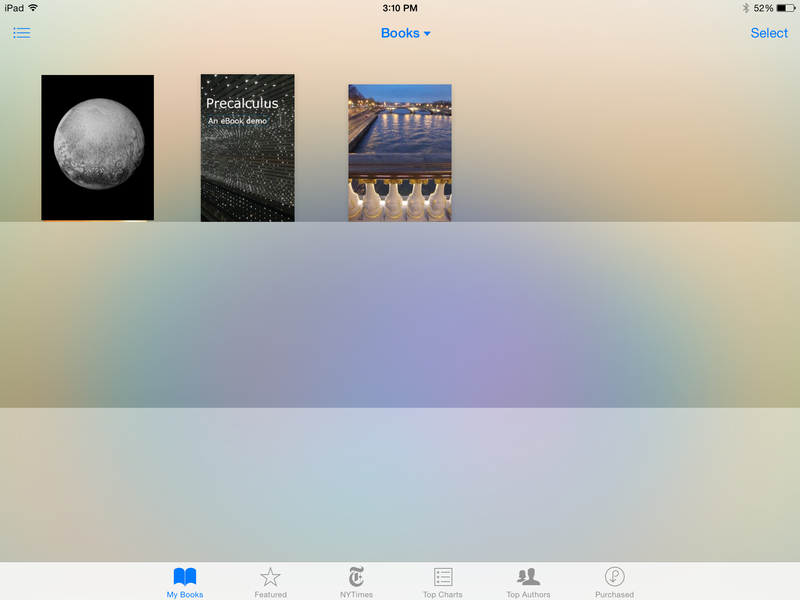 The tool offers a variety of transition effects that govern the transitions between pages. For the questions themselves, the authoring tool gives the option not to reveal the answers. I chose to reveal the answers. If I had chosen not to disclose the answers, I would have needed to redirect participants to resources where they can learn the answers in order to retake the challenge. In some contexts, this would have been preferable. The introduction is a Text page type. 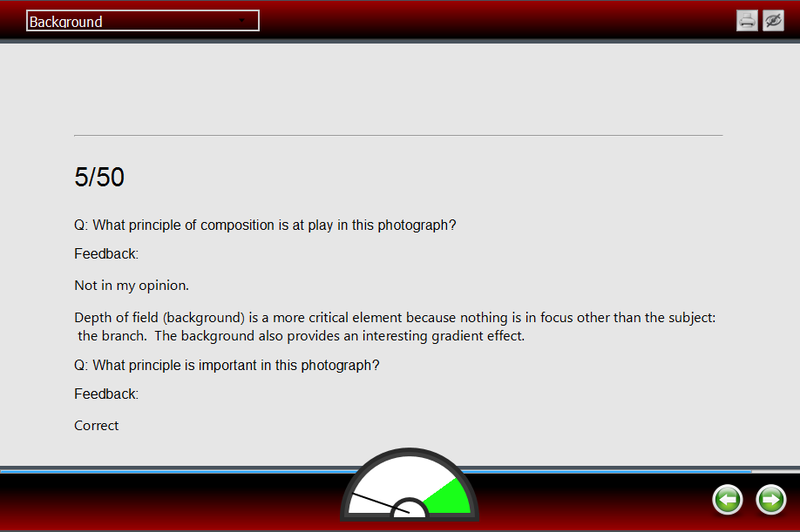 The first question was constructed with the layout type of Question(Simple Layout). With this layout type, I could have chosen to provide unique feedback for every distractor (answer option). Instead, I used a new LodeStar feature, which is to offer page level feedback. If the question were answered incorrectly, the feedback would display a resource that would help the participant learn more about the term, practice or theory. Regardless of the layout type, I assigned each question either 1, 2 or 5 points to match the level of difficulty or effort required to answer the question. In Level Two, I created slightly more involved question types. I used the Text layout but added questions to the text page by using a simple mark-up. The markup is <s> for question stem, the question itself. <d> is for distractor, or answer option. 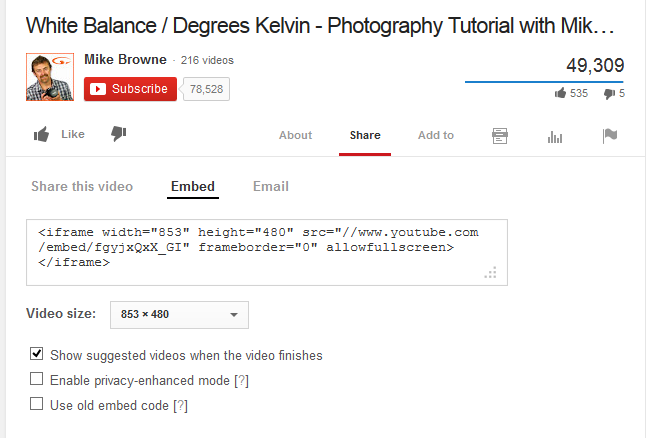 The following screenshot shows the markup in action. 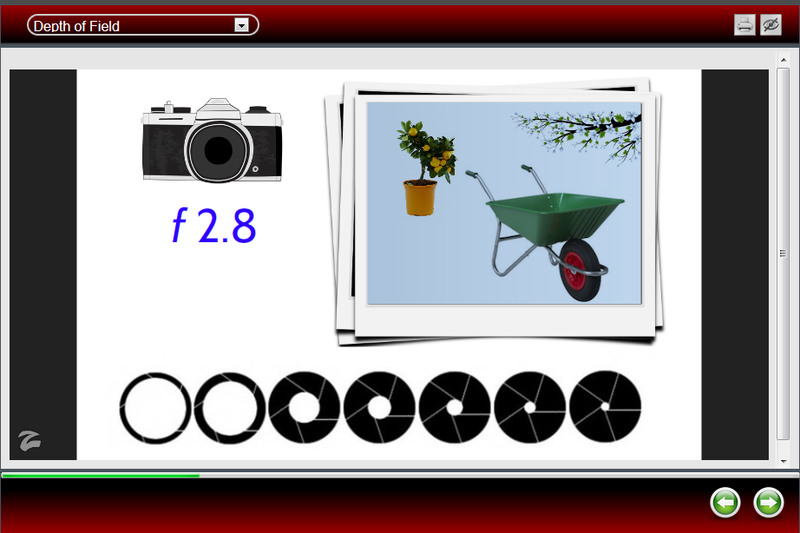 This allows for any number of distractors, and any content including images and mathematics mark-up using MathML. To give participants an update on their score and to compile the corrective feedback in one place, I added report pages. You may notice, if you take the challenge, that each report page displays an error pop-up message. This message occurs when LodeStar attempts to send the score to the underlying Learning Management System. In this case, there is no Learning Management System. I could have chosen to make the error silent, but I wanted to display a LodeStar object at work trying to communicate the participant’s score. In Level Three of the Challenge, I included some categorization and matching questions. To generate these, authors simply type in the question or the directions and then type in a term on the left and its match on the right. LodeStar then randomly rearranges the matches on the right. Finally, we have the Gate that decides whether or not the participant gets the badge application information. If the participant scored 85% or above, the badge information displays. If not, the gate branches to an apologetic message. In the screenshot below, we see that the Gate plays multiple roles. 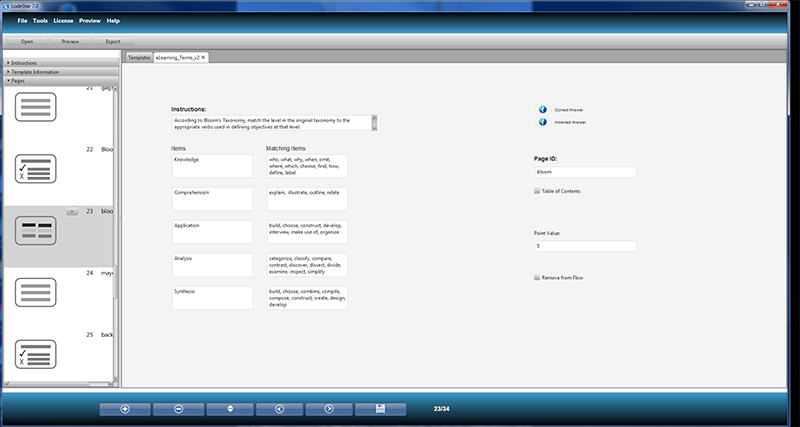 Screenshot of the Gate page type. From top to bottom: the instructor uses a Gate to decide whether or not the score is reset. The instructor, for example, can decide to branch the user to a remedial section, with a reset score so that the student can try again. I didn’t reset the score. Next, the Gate offers the option to enable the Back and Next buttons. The Gate will automatically disable the Back and Next buttons, unless the instructor explicitly allows them. The Gate supports custom scores. The instructor can choose to track a certain category of questions and then branch based on a custom variable assigned to a group of questions. I could have chosen to assign a score to a custom variable called ‘Basic’ versus ‘Intermediate’ or ‘Advanced’. Level One questions could have appended a value to ‘Basic’. Level Two questions could have appended a value to ‘Intermediate’ and so on. At some point, I could have branched on the variable. But I didn’t. Gates decide whether students pass or fail. If they pass, they follow the branch options spelled out in ‘Pass Message/Branch Options’. If they fail, they follow the branch options spelled out in ‘Fail Message/Branch Options’. 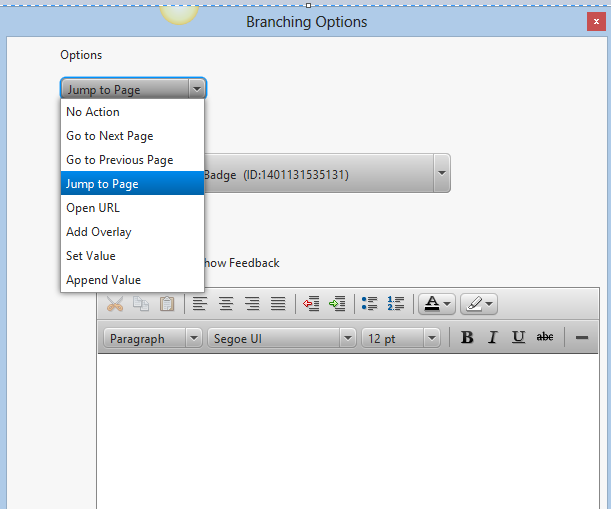 The options are found under the blue ‘branch’ button. The Gate also allows students to go down the Pass branch regardless of score. In my case, I typed in ’85’, and checked off ‘Use Percentage’. This means that students will only follow the Pass branch, if they scored 85% or greater. Finally, if I wanted to reset a custom variable, I would have typed in the name of the variable (case sensitive) in the field labeled ‘Reset comma-separated List of Variables’. 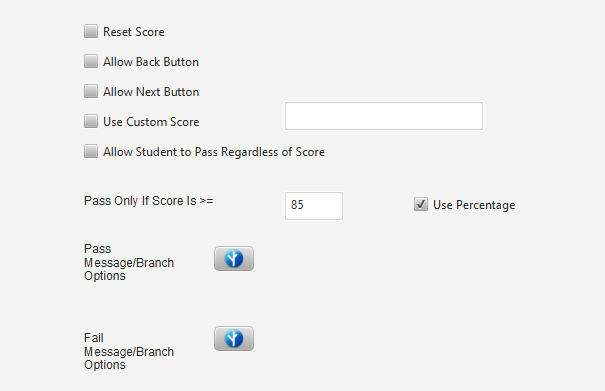 The last two options relate to the custom variables or scores to which I referred earlier. In conclusion, the current build of LodeStar 7 allows me to select a nice theme and modify it, choose a page transition, choose from many different page types, report scores, and branch according to performance. 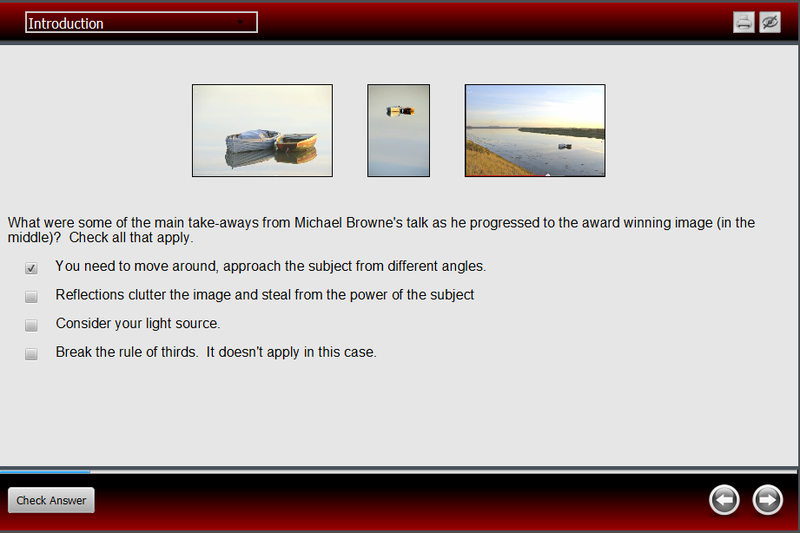 The current build also includes an improved audio player and the ability to randomize distractors (answer options). So, we’re moving in the right direction. Support us. Let us hear from you. Make comments. Tell others. For those of you who have stumbled upon this journal entry, our web journal is dedicated to instructional design and how the LodeStar authoring tool supports instructors in that endeavor. Our firm belief is that, with the right tool set and training, instructors can remain the authors and orchestrators of highly engaging and effective online learning experiences for their students. The LodeStar authoring tool enables instructors to create interactive learning objects for a variety of learning environments including all major learning management systems (e.g. Desire2Learn, Moodle, Blackboard) Curriki, eFolioWorld, MyEfolio, and any website to which an instructor has access. I am excited to report that the latest version of LodeStar is about to be released: LodeStar 7 Lite. Over the course of LodeStar’s twelve-year history, I’ve observed how instructors interact with authoring tools and where some of the stumbling points lie. I have also recognized where LodeStar can’t compete. 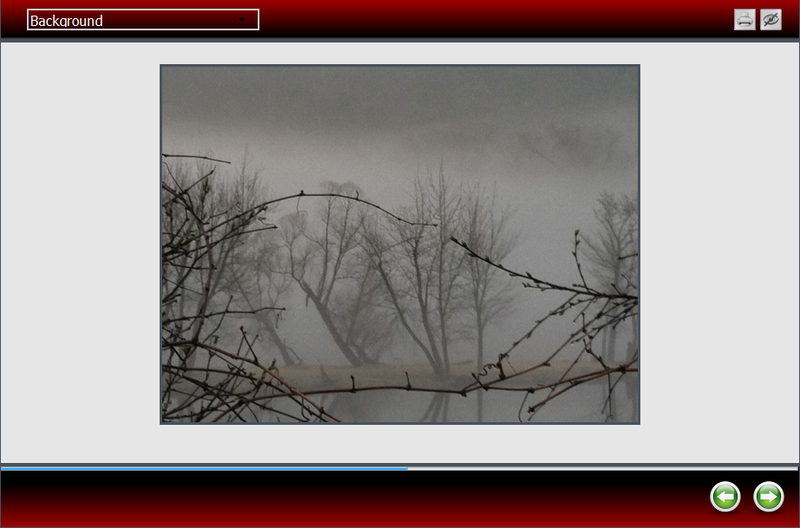 Some tools offer decent screen capture; and others do a good job with PowerPoint conversion. Some tools offer the full expressiveness of a powerful programming language but without the complexity. ZebraZapps is an example. Instructors need multiple tools, however. LodeStar complements the best tools found in academia. The future of LodeStar lies in its ability to offer instructors a rich range of engaging strategies and ease of use. 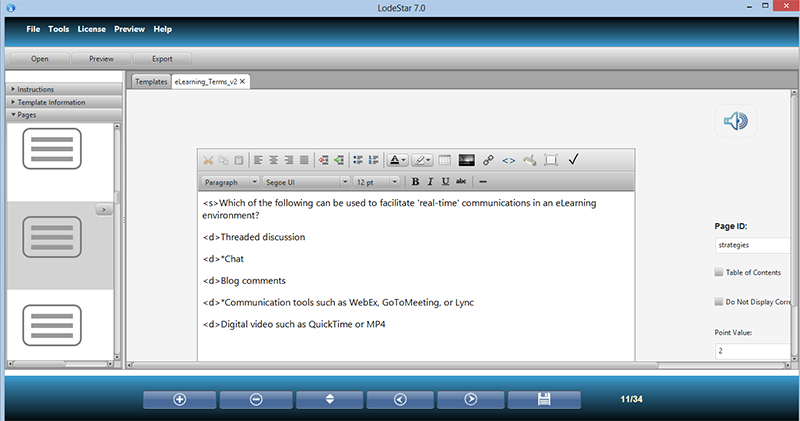 When instructors wish to create, for example, an interactive, simulated interview in which students must make key decisions based on their content knowledge, LodeStar should be the tool of choice. LodeStar7 was a complete re-visioning of that value proposition. For years we glued on features and sometimes left the instructor behind. LodeStar 6.7 had a powerful vector graphics drawing capability that supported drag and drop and click/touch interactivity for all devices. But unless instructors were specifically trained, they didn’t tap into the richness of LodeStar 6.7’s ability. LodeStar 7 changes that. LodeStar 7 Lite pares away features and re-introduces them in a more integrated, intuitive manner. Not all of the features will be immediately available in LodeStar 7 Lite. Spell check is missing. Drawing is missing. But, in time, those features will return. In the near future, drawing and interactive graphics will be a first-class citizen of the tool, not an add-on. LodeStar 7 Lite is currently in alpha testing. The first workshop is scheduled for the end of October. If all goes according to schedule, it will then make its debut in a statewide webinar in November and be featured at the Minnesota Government IT Symposium in December. The missing features will hopefully be repatriated by the conclusion of February. 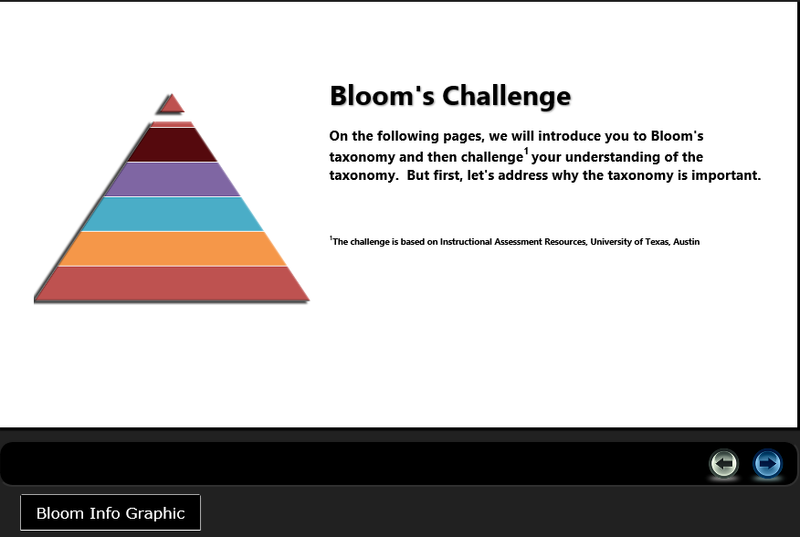 Then the focus will be on creating insanely brilliant templates that instructors will absolutely love. 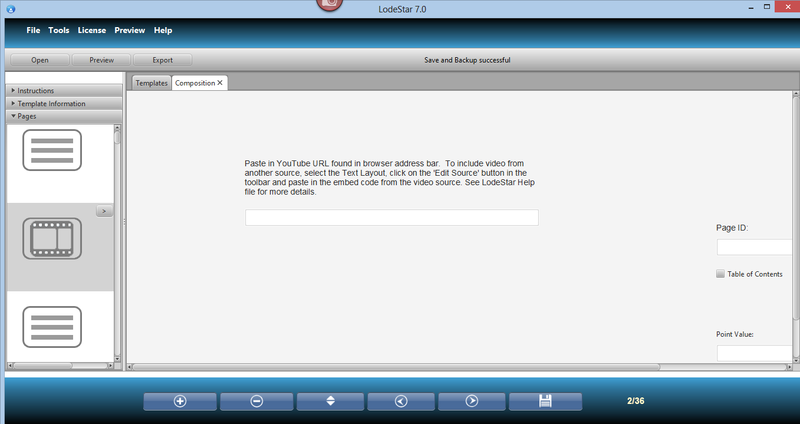 In the meantime, here is a sneak preview of some of LodeStar 7 Lite’s features.